During my childhood days, like many of you, I have followed the Indian parable of six blind men describing an elephant. Each blind person thinks of individual elephant part as something else. John Godfrey Saxe has written a beautiful poem about this short-sightedness. This is a great challenge many organizations are facing where very few people are able to visualize customer needs, product vision and what to build and map them together into a cohesive picture that can be communicated, built and delivered to the customer. 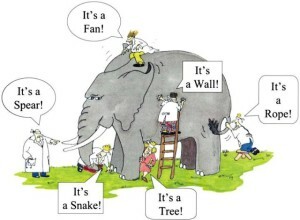 Mapping this to the elephant story, a leader, firstly, should be able to have a holistic view of the product and service. Creating this vision is easier said than done. Secondly, a leader should be able to communicate the relationship between parts and the whole. Since multiple teams and people work on smaller parts, the chances of mismatch are higher. Like how each blind person thins about different parts of an elephant. 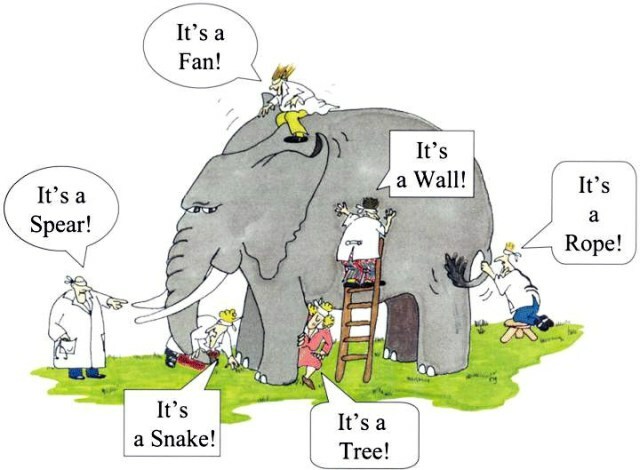 Lastly, as the team starts building the product, a leader should be able to identify the deviations from vision and guide the team to build the right product – be able to call elephant an elephant. This is no way different from creating the cohesive picture that I described earlier. I guess this leadership is what many organizations need today. This entry was posted in Leadership by Hemant Khandelwal. Bookmark the permalink. Why don’t leaders think about participative leadership? If the Envisioning exercise has participation from all concerned it will make things much easier. Vision, Shared Vision, Communicated Vision, Participative Vision, Organization Vision. Unless there is the DNA for collaborative vision, it is very difficult to be aligned. Very good point. There is little scope for collaboration with silos that exists in most organizations.